The azure Mediterranean, impressive ruins and seaside cities call Greece home. Though Greece has seen a tumultuous political landscape in recent years, it remains one of the most popular travel spots in Europe thanks to its extensive history, beautiful coastline, and enviable Mediterranean climate. As one of the first civilizations in modern Europe, Greece is the birthplace of colorful mythology, the modern alphabet, and organized democracies. This ancient history is still very much alive in Greece, particularly when you visit Athens, the capital city. What’s perhaps most striking here is the way daily life carries on amidst the ruins, with modern metro lines shuffling locals to work and trendy restaurants tucked away in unassuming, millennia-old courtyards. Still, there’s far more to explore in Greece than remarkable ruins and endless history. Situated on prime southern European coast, Greece enjoys a gorgeous Mediterranean climate, which makes the miles of unspoiled beaches and coastal villages tucked high in the cliffs all the more enjoyable. 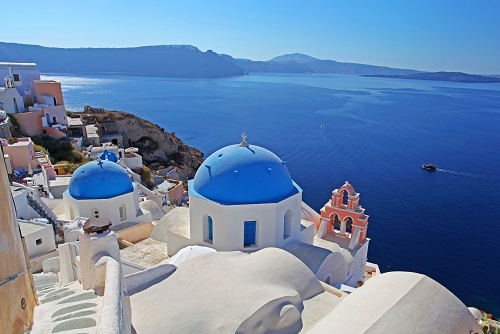 Try visiting Santorini or the famed Greek Islands for an idyllic and romantic Greek holiday. Whether you want to take a horseback ride on a volcanic beach or sample wine at a local vineyard, the incredible diversity of the coast ensures a stunning panorama along every turn.